They knew about global warming...and did worse than nothing. They repeatedly fought efforts to move the country away from fossil fuels. They slowed progress on the most important challenge of our time. And some continue to spread disinformation and obstruct climate policies even today. All while being aware of the role their products play in climate impacts. These companies should immediately stop funding climate deception. They should bear their fair share of responsibility for the damage caused by their products. The Climate Accountability Scorecard, an in-depth analysis of eight leading fossil fuel companies, ranks them on their climate change actions and urges specific, immediate steps they can take to improve. Leading fossil fuel companies have knowingly worked to deceive the public for decades about the realities and risks of climate change. Their deceptive tactics—both individually and collectively through industry associations, think tanks, and front groups—are highlighted in The Climate Deception Dossiers, collections of internal company and trade association documents that have either been leaked, come to light through lawsuits, or been disclosed through Freedom of Information (FOIA) requests. 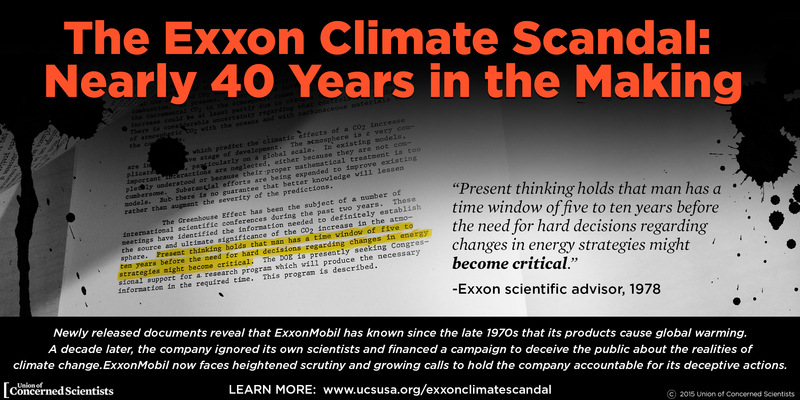 Investigations by Inside Climate News and the Los Angeles Times have revealed additional evidence that ExxonMobil and other companies have known about the risks of climate change for decades. ExxonMobil is under investigation by the attorneys general of New York, California, and Massachusetts for deceptive practices and potential fraud. These investigations are likely to expand in the months and years ahead to include other companies, states, and potential federal action. Climate impacts are intensifying around the world and fossil fuel companies must be held accountable for their climate actions. Science now makes it possible to calculate how carbon emissions traced to individual fossil fuel companies have contributed to specific climate impacts. For example, we now know that nearly two-thirds of all heat-trapping emissions over the last century and a half can be traced back to just 90 entities. New and developing research will make it possible to further pinpoint how much ExxonMobil and other major fossil fuel producers bear responsibility for heat waves, rising global temperatures, and more. Governments, industry, and individuals all bear some responsibility for climate change. But major fossil fuel companies—including ExxonMobil, Chevron, Shell, BP, ConocoPhillips, Peabody Energy, Consol Energy, and Arch Coal—are substantial contributors to the problem, and therefore must take responsibility for their actions. Reject disinformation on climate, including through their trade associations and other lobbying groups; they should also publicly disassociate themselves from such groups and their activities. Support sensible climate policies to reduce global warming emissions. Fully disclose the financial and physical risks of climate change to their business operations. Align their business models with a carbon-constrained world consistent with keeping warming well below a 2°C increase above pre-industrial levels, as agreed by world leaders. Pay for their share of the costs of climate-related damages and climate change adaptation. Who Are the Largest Producers of Industrial Carbon Emissions? 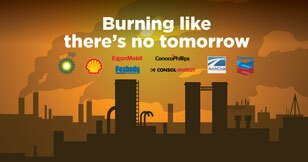 See how major fossil fuel companies rank on climate deception, disclosure, and action. Fossil fuel companies and their lobbying groups have been deceiving the public for decades about the facts of global warming. 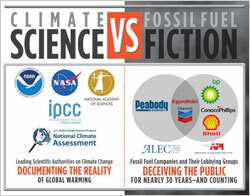 Internal fossil fuel industry memos reveal a deliberate campaign to deceive the public that continues even today.